Dedicated to the known writers of Mr. Dalek - Adam Purcell, Karen Dunn, Tony Gallichan, Retro Robot and Martinus Scriblerus. Also dedicated to Lisa, my darling. 'You can be really boring,' surmised Mr. Dalek. 'They're remaking Bagpuss!' shouted Adam, his voice three octaves higher than normal. The sound of Adam caused Mr. Dalek to approach. Mr. Dalek drove on his castors to the top of the stairs, then silently hovered down, landing at a discreet location. Mr. Dalek rolled into range to hear Adam continue his tirade. Bored now, Mr. Dalek decided he needed to exterminate something to improve his mood. Rolling past a box marked 'new toy', Mr. Dalek found the next object of his destruction. The Scooby van. Filled with lots of 'scooby snacks' that Shaggy ate when Scooby was not looking. Ready. Aim. EXTERMINATE. There, now Mr. Dalek felt better. After hovering back to Adam's room, Mr. Dalek decided to check in on Adam's toys, or as Mr. Dalek referred to them, 'my fearful subjects to rule, scare, and slaughter'. Pinky was asking Brain what they were going to do tonight. Brain said they'd do what they did every night - plan to take over the world. Boring. Scooby was bench pressing two DVD boxsets that were much bigger than himself. Still boring. Shaggy and Daphne were arguing. Hmm, that sounds interesting. Mr. Dalek seemed rather pleased at the end of that conversation, and looked around at his subjects, trying to decide who to interact with next. Clearly, Mr. Dalek was the greatest one and a half inch Dalek with a Made In Taiwan logo stamped on him in the world. He was on top of the world, but he was still bored. Tired, drowsy, Mr. Dalek did not even notice as his eyestalk closed and he drifted to sleep. Mr. Dalek awoke the next morning to find himself and the rest of the toys on Adam's dining room table. Everybody was there, including the people Mr. Dalek exterminated before, because they always came back the next day. 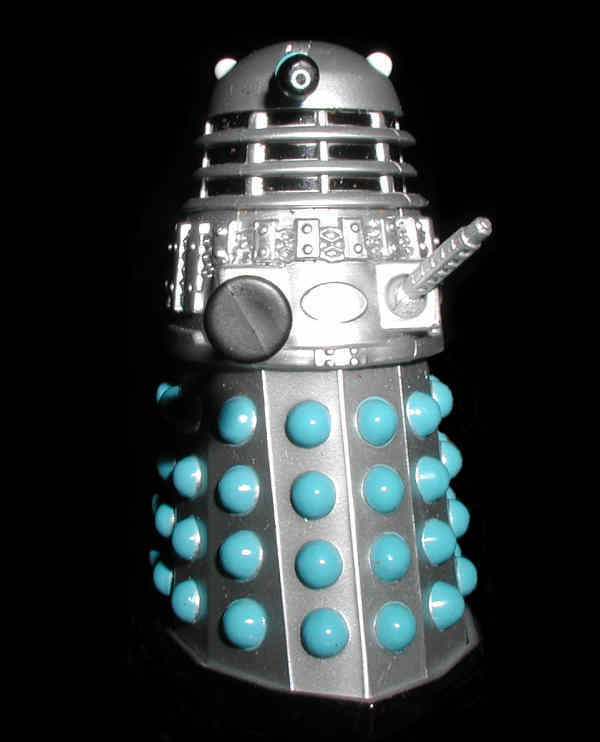 It was the annoying part of extermination as a toy Dalek - the victims always come back to life. The monotony of it all. If Adam had everybody on the dining room table, it could only mean one thing - another toy was joining the shelf in the bedroom. Mr. Dalek pondered - Who is Scrappy Doo? - as he hid another Velma jumper behind the television. Inside the bag that Mr. Dalek had passed and ignored last night came the phrase "Puppy Power!" Adam brought out Scrappy. Scrappy was even smaller than Scooby, but he seemed much more like a human. He stood on two legs, he spoke English (American English, but what can you do? ), and, well, just looked like a matinee idol dog. If John Barrowman was a dog, he would be Scrappy. And a dog would be easier to exterminate, so Mr. Dalek began to fantasize about John Barrowman becoming a dog. It would break the dull slog of life around here. As the day progressed, Mr. Dalek found himself fascinated by the antics at the Scooby Mystery Machine van. The initial thrill of having a new friend, a friend who loved them and could recite all their stories - it had already faded. Scrappy had eaten two of Velma's jumpers that Mr. Dalek had not gotten around to stealing yet. Scrappy torched the 'scooby snacks' so that the smell would not affect his nose. Mr. Dalek had some trouble convincing Adam that he had not caused that fire. Scrappy even tried to chat up Daphne. Plus, he mistook Willow's magic cauldron for the puppy litter box. All this carnage, and Mr. Dalek had not done a thing. It happened without his help. Mr. Dalek was not needed to terrorize the toys. Scrappy terrorized the toys for him. Mr. Dalek - could rest. Years of exterminating the same people and toys, living out the same patterns, getting poked and prodded during tapings of the Staggering Stories podcast - Mr. Dalek felt he was in a rut. Now Scrappy provided an escape. That night, Mr. Dalek persuaded Scrappy and a gullible Shaggy (after a few Scooby Snacks) to capture and tie up all their friends very tightly so that none of them could run away. Ignoring the terror possibilities (this was a business meeting), Mr. Dalek addressed his citizens. 'My citizens, I have decided that it is time to take a break from the vigourous work of ruling you all. In my absence, you shall consider Scrappy Doo to be your ruler. Obey him as you did me, or I shall come back and Exterminate you all.' Mr. Dalek exterminated Dawn, just to make a point. A prickly sensation at the back of Mr. Dalek's head told him that Buffy was an only child, so how could she have a sister named Dawn. But Dawn was exterminated, the point was made, and Mr. Dalek hovered out of the room, leaving Scrappy to decide when to untie the prisoners. Let us just say, they were not released until morning when Adam came upon them. Mr. Dalek sat with Adam and watched television. Every day. At first, Adam thought this was an odd change of pace for sprightly Mr. Dalek. But soon Mr. Dalek felt like part of the furniture. He'd even get a bit of dust on when he forgot to move for a few days. The only time Adam did not find Mr. Dalek downstairs was when Adam's friends visited, and Adam would find Mr. Dalek trying to get up the stairs to avoid the inevitable playing with casters and eyestalk. After a few months, Mr. Dalek even stopped trying to get away from that humiliation. Mr. Dalek just sat, and sat. He got a sardonic grin inside when he heard screaming and horror upstairs - Scrappy had done something awful to the toys again. Christmas 2008 came along. Adam's friends came bye for their Christmas podcast recordings. First, they would do their silly show for the world. Then, they would make up some exciting adventures about Mr. Dalek. Mr. Dalek wiggled his eyestalk and shook with energy for the first time in a long while, excited to hear about his latest great fictional adventure. The show came to an end, everybody had a going away glass of sherry, and Adam was the only adult construct in the house. But where was the Mr. Dalek story? Mr. Dalek was most annoyed, and objected to this situation strenously with Adam. Enough! screached Mr. Dalek inside his casing. You can never have enough of my stories. How can I be uninteresting? I watched Television with you. And then I ... but first I ... and soon I ... I've done nothing of interest. For a further embarrassment, Mr. Dalek noticed that he just thought all this and hadn't said anything aloud, so Adam had got bored and went to open his new present. Davros. AAAAARRRRRRGGGGGGHHHHH! screamed Mr. Dalek to himself. That interloper altered time and made himself creator of the Daleks without our consent. Dalek history was much better when we came from the Dals. Brain had never heard Mr. Dalek ask for help before. He certainly had not heard Mr. Dalek make a gulp noise. Fascinated in spite of himself, Brain listened to Mr. Dalek's tale of woe. Pinky suggested wearing long johns to stay warm, so at Brain's request Mr. Dalek exterminated him. They came to a conclusion - If Mr. Dalek wanted his life back as ruler of the toys, he needed to get rid of both Scrappy and Davros. Not just exterminate Scrappy and Davros, because they both would return. But eliminate permanently. 'Eliminate me! Scrappy! Ruler of you all!' Clearly Scrappy had been listening in. Mr. Dalek turned and faced the tiny dog. 'Yes,' said Mr. Dalek. 'I must put you where Adam can never find you, and regain my rightful place among the toys. Then I must do the same to Davros, who you have not met yet but is even more annoying and sychophantic than you.' To Mr. Dalek's amazement, all the toys hooped and hollered in joy at the thought of his return to power. Particularly the Scooby gang. Mr. Dalek could only ponder the horrors Scrappy had inflicted on the team, and imagine how he could recreate those horrors once he was back in control. 'Only I - Mr. Dalek - can torture Mr. Dalek's chosen people.' The praise from the toys muted a bit after that line, but even the threat of death from Mr. Dalek was less horrific than Scrappy. 'We'll see about that!' screamed Scrappy, with a girlish yet ferocious growl. Scrappy bit Mr. Dalek on the neck, and actually made teeth indentations. Scrappy held Mr. Dalek in a paralytic grip, keeping himself out of range of the extermination ray. Scrappy hauled Mr. Dalek to the open window - just a moment here. Adam, why do you have an open window at Christmas? Anyway - Scrappy made a mighty shake with his neck, released the grip, and sent Mr. Dalek flying through the air. Mr. Dalek landed on the street, just beyond Adam's car. This was harder than he thought. Mr. Dalek had let himself become weak, and Scrappy Bleeding Doo had replaced him at the top of the toy chain. How humiliating. Mr. Dalek wished, just for a moment, that he could tell his earlier self to dispose of Scrappy when he had the chance. To live life to the fullest. Be the best Dalek he could be. The thought was cut short by the screaching sound of the car that did not have time to stop before hitting him with a tire. The tire deflated and Mr. Dalek was thrown to another part of the street. Mr. Dalek passed out. Mr. Dalek awoke to find himself on a street that looked very much like the street in front of Adam's house. Indeed, he saw Adam's house. But it all looked different. Mr. Dalek struggled to get to the curb. His anti-gravity was offline and one of his wheels was badly bent. Suffering from great pain, Mr. Dalek climbed onto the sidewalk and tried to sheepishly stroll, er, wobble home. Maybe Adam would repair him. 'Who is Adam? This is my house. I have owned it for 5 years, since 1968,' continued Mean Grunt, with a gruff form of speech that women would find oddly arousing. Mr. Dalek decided that it was best to let the situation play out. Had he gone back in time, was he in a coma, or was it some bad turkey Mr. Dalek had eaten off Adam's table earlier. It did not matter. Mr. Dalek would do something with his life, and see what happened. True to his word, Mean Grunt got Mr. Dalek all fixed up and shiny again. Mr. Dalek exterminated the people who worked on him, but spared Mean Grunt. For two months, DCI Mean Grunt solved the crimes of the town with faithful Mr. Dalek in his front pocket. When a suspect was cornered, Mean Grunt would pull out Mr. Dalek to make the slimeball talk. If they were not satisfied with the information, or if somebody was in a bad mood, Mr. Dalek got to exterminate the suspect. A remarkable 97 crimes were solved during this period, though 47 suspects wound up on the Missing Persons list. Alas, Mean Grunt was Sectioned to St. Mary's Psychiatric Hospital for spending all his time talking to a one and a half inch toy with Made In Taiwan stamped on it. Mr. Dalek asked Terry to say he was joking or Mr. Dalek would exterminate him. Terry said he was serious, so Mr. Dalek exterminated him. The Dalek timeline was safe from tinkering by its non-evil creator. Hooray! By fortunate circumstance, Terry's house was across the street from a Convention Center. On the Convention Center was a sign - 'Meet The Writers Of Scooby Doo'. Well, thought Mr. Dalek. That was easy. Mr. Dalek started to wheel down the sidewalk when a little construct got in his way. Mr. Dalek reminded himself that constructs like these are called children, and Adam had promised violence if Mr. Dalek ever harmed a little construct. But Mr. Dalek had trundled on to the Convention Center by now. Being so small, nobody asked him for a ticket or money or other important things Mr. Dalek did not have. Mr. Dalek was able to go to the front row and listen to the Scooby Doo panel. Very pleased with himself, Mr. Dalek left the Convention Center. Many fans were most upset with Mr. Dalek. Some tried to kick him or stamp on him. Those fans were exterminated. Mr. Dalek understood. The fans were unaware of the pain and suffering that Scrappy could cause. Only Mr. Dalek was allowed to cause such pain. And now only Mr. Dalek would have the power to do so. It was clear that Mr. Dalek was going to have to live his life day by day till he returned to 2008 and Adam. Mr. Dalek got himself various jobs to stay incognito and make money that Adam could use to buy more toys for Mr. Dalek to exterminate. (Just no more toys that could take power, please.) Mr. Dalek learned of a line of Daleks to be made in Taiwan. He decided to change the specifications so that all the Daleks had real Extermination rays like his own, making them so much more precious and dangerous to their owners. He also redesigned them so that the eyestalk had more motion and all the body parts could swivel around for attack formations. The only thing better than the ultimate killing machine is the ultimate killing machine - with improvements. A few weeks after the order went out, Mr. Dalek noticed that his own features had changed to match those of the toys he sent out. He had changed his own batch. Mr. Dalek had full eye control and could shift his body in all directions! Fantastic! Oh wait, that was the line of a future Doctor he had to exterminate. Anyway, Mr. Dalek took pride in the great work. Just as he took pride in the series of mass slaughters that erupted as little constructs got their toy Daleks and set the Daleks on their enemies the next Christmas. Eventually, young Adam moved in to the house. Mr. Dalek's house. But Mr. Dalek could not go home yet. Adam and the younger version of Mr. Dalek had to have their adventures. Indeed, Mr. Dalek was not sure when he should arrive. The time line had changed in many ways. Much better TV, many fewer people alive. Around January 2008, Mr. Dalek could no longer stand the confusion in his mind. Mind. Brain. BRAIN! Brain would have the answers. Brain made up that malarky about seeing the timelines. This was Brain's chance to prove himself. Or be exterminated trying. Brain scanned the timelines that might have been, finding Mr. Dalek's old one and comparing it to our own. Brain had to admit that Mr. Dalek had made some improvements. Without Scrappy's influence Gordon Brown had stayed in accounting and UK budgets would be balanced for another 50 years. Doctor Who had run the same number of years, but the Dalek stories without Davros got an extra two million viewers each. There were other changes (like the mass death), but this short story is in danger of becoming a novella. Brain told Mr. Dalek there was only one thing to do. After exterminating Brain, Mr. Dalek hovered down the stairs. To his amazement, it was the same night that he had wandered past the box that Scrappy had been in. And a box was in the same place. Well, at least it would not be Scrappy this time. It would be another toy. Mr. Dalek ran straight in to - Mr. Dalek. Mr. Dalek awoke the next morning on Adam's dining room table. He had two sets of memories. He was both Mr. Daleks. He was a better Mr. Dalek. He understood the responsibilities he had to his subjects and victims. The power he must never let slip away again. Life is exciting. Live life to the full, and take away life from everybody else! Yeah! At this point, Adam introduced everyone to their new playmate, Elmyra. Post Script: Mr. Dalek read this story out to the Staggering Stories people at Christmas 2008. Unfortunately Tony failed to press record, so Mr. Dalek exterminated him. Not very much - just his voice. Real Keith objected to this most strenously - so Mr. Dalek exterminated his voice too. Fake Keith pointed out that she wrote several of the Mr. Dalek stories. Mr. Dalek pointed out that he lost in all of them - and exterminated her voice. Andy opted not to speak - not to worry, Mr. Dalek knew where your voice was too. Adam threatened to delay Mr. Dalek's story for a long time if Mr. Dalek did not calm down. Since Adam then found his voice exterminated, it is not too surprising that this story did not come out at Christmas 2008. Still, another holiday has to be here soon. Happy whatever the day is! Written - May 2009 by Benjamin F. Elliott. TWIDW Inc for Staggering Stories. No copyright infringement is intended on Doctor Who, Scooby Doo, or any other fictional character. If you are a real life character you're on your own - consider it parody.